Half Dome is easily one of the most famous sites of Yosemite National Park. Half Dome is literally a dome that stretches more than 4,737 feet above the ground of Yosemite Valley. This dome is comprised of granite and its massive size is truly magnificent to behold. Rising nearly 5,000 feet above Yosemite Valley and 8,800 feet above sea level, Half Dome is a Yosemite icon and a great challenge to many hikers. 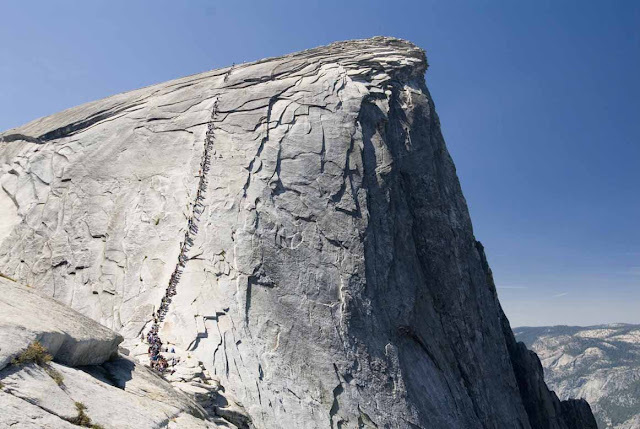 Permits to hike to the top of Half Dome are required seven days per week when the cables are up (as called for in the Half Dome Plan in order to protect wilderness character, reduce crowding, protect natural and cultural resources, and improve safety). The 14- to 16-mile round-trip hike to Half Dome is not for you if you're out of shape or unprepared. 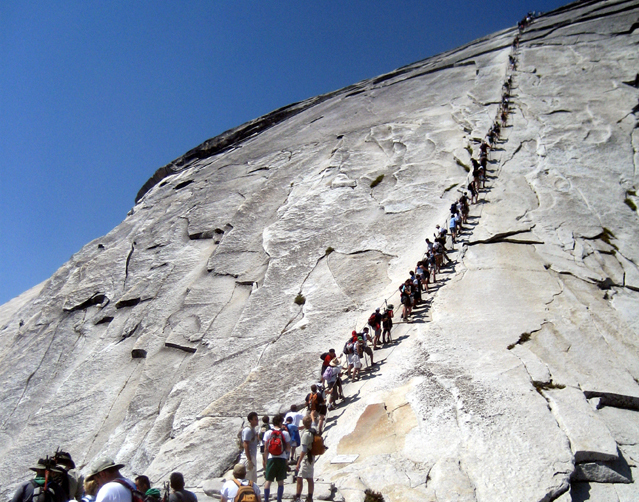 You will be gaining elevation (for a total of 4,800 feet) most of your way to the top of Half Dome. Most would say the reward is worth the effort. Along the way, you'll see outstanding views of Vernal and NevadaFalls, Liberty Cap, Half Dome, and--from the shoulder and summit--panoramic views of Yosemite Valley and the High Sierra. The most famous--or infamous--part of the hike is the ascent up the cables. The two metal cables allow hikers to climb the last 400 feet to the summit without rock climbing equipment. A maximum of 300 hikers will be allowed (about 225 day hikers and 75 backpackers) each day on the Half Dome Trail beyond the base of the sub dome.